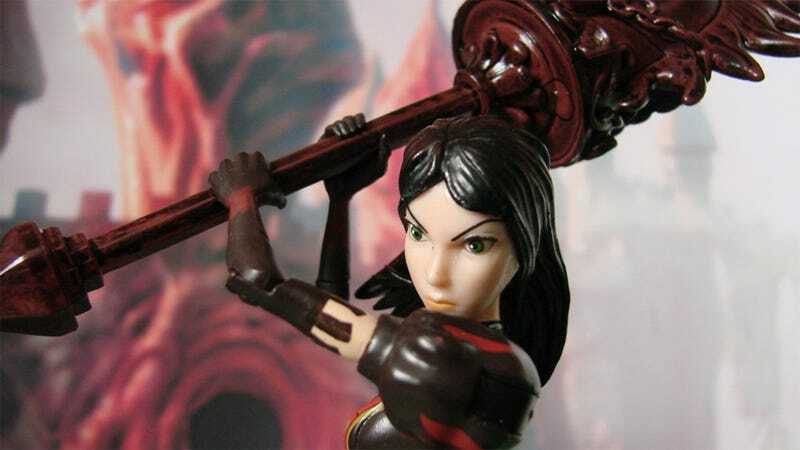 More than a year and a half since the game's release, Diamond Select Toys prepares to unleash action figure based on American McGee's Alice: Madness Returns. Royal Suit Alice is going in the kids' room when she arrives next month, and not just for the trauma factor. I'm not a bad parent — well, not for this at least. See, when Alice: Madness Returns arrived in June of 2011, my two children had been born days earlier (June 9). They were premature, which meant a stay in the newborn intensive care unit, but since the more difficult one required a procedure to repair one of his heart valves, he was shunted off to another hospital on the other side of town. For two weeks my wife and I traveled back and forth between two hospitals, coming home to a home with an empty baby room. The only thing that kept me sane was losing myself in an interactive electronic exploration of insanity. So yeah, eventually my kids will get to know Alice. I'll give them a few years before explaining the Vorpal Blade, Hobby Horse and Pepper Grinder accessories, but they deserve to meet the girl that kept their father from going crazy while they were finishing cooking.